LXR Travel maintains the highest level of security and privacy for our travelers’ personal information. Once a traveler profile is submitted and the contents are entered into our Sabre reservation system it is permanently deleted and can no longer be accessed. We use ShieldQ, which is PCI Compliant, to submit/upload and store the profile. Once it is accessed by authorized staff at LXR Travel, it is permanently deleted. Complete the Traveler Profile Update writable PDF form on-line. 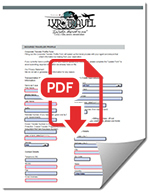 Save the completed PDF form to your on-line device. If you do not have Adobe Acrobat, Print to a PDF using the 'Microsoft Print to PDF' or Apple's 'PDF' button. Change the file name and save as a flattened PDF when possible to ensure your information is saved and will upload properly. Return to https://www.lxrtravel.com/securedtravelerprofile/updateform-travelerswithexistingprofiles and click the ADD button in the SheildQ box and select your completed profile PDF form. Make sure you see the form name in the box after adding it. Delete your saved completed PDF file from your device or redact sensitive information. If you are unable to upload successfully or need assistance, please contact profiles@lxrtravel.com. Users can download, scan, photograph, sign and upload documents/images via desktops or mobile devices, transmitted directly to the PCI-accredited, secure document management queue. ShieldQ, as part of the InterFAX group, is PCI-DSS Level 1 compliant: the highest level of PCI accreditation. With ShieldQ, sensitive card data never touches client servers. ShieldQ has received an Attestation of Compliance (AOC) from an independent, approved PCI-Qualified Security Assessor (QSA). Click on the SheildQ logo for more information.